[Buyer’s Guide]: What Are The Best Bedside Gun Safes in 2019? Gun safes don’t always have to be bulky and large. There are smaller safes which are designed for storing smaller items, meanwhile offering robust security and concealment. Here we’ll be talking about bedside gun safes, or nightstand, gun safes, whatever you may call them. We will learn about the factors one must take into consideration before buying such a gun safe. We will also talk about the key points of maintaining these safes, so they function properly and last long. We have handpicked and reviewed the best bedside gun safes on the market, to help you with choosing one. Buying a gun safe is vital to your safety, as well as the safety of your valuables. A bedside safe can either be kept in a closet, wardrobe, or even your bedside nightstand. Such a safe must be protective against forceful intrusions by thieves, as well as inquisitive touches by kids. Hence a gun safe must feature certain qualities and characteristics to ensure their effectiveness. Some of these factors might seem redundant, but they still play a very important part in specific situations. 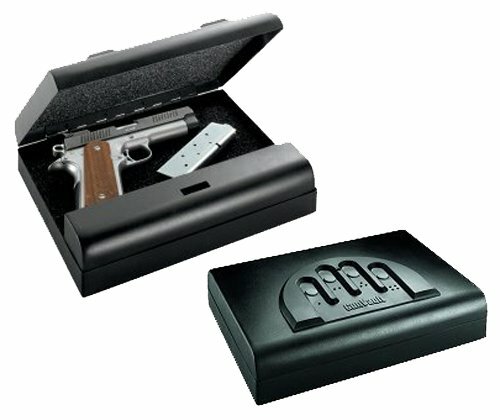 ​Bedside gun safes are lightweight and portable so they can be displaced or carried anywhere by you. However, a good bedside gun safe must have some sort of mounting options available. Most such safes have pre-drilled holes on their base so they can be bolted down inside a drawer or over the nightstand. Mounting a bedside gun safe ensures that it won’t be carried away by a burglar who might plan to sack up things quickly and open them in peace. ​If you are buying a bedside gun safe, you will store some valuables in it. It might be your favorite handgun, media, jewelry, or any other item you love and can’t bear a scratch on. An interior lining in the gun safe ensures your valuables won’t get scratched even if you handle the safe roughly. Additionally, if somebody tries to shake up your safe for a forceful entry, the contents inside will remain protected and intact. ​A quick access gun safe is extremely helpful in an emergency. You can’t expect yourself to find the keys and meddle with the lock at night when there’s an intruder in your house. Quick access mechanisms like fingerprint locks, RFID, and keypad locks are always the best bet for a bedside gun safe. Since most safes with such locking mechanisms have a backup key, you don’t have to worry about losing the credentials or batteries running out. ​A gun safe has to lock up your valuables securely, hence it has to be sturdy. A good bedside gun safe must be made of thick gauge steel or military grade polymer. This will ensure that your safe is resistant to pry attacks, even by using sophisticated power tools. ​A good bedside gun safe must also be resistant to fire. The best way to determine this is to check the UL rating of the safe. UL rating is the international benchmark of the safety and standard of a product. Safes with UL 350 rating offer protection only to papers. UL 150 rating indicates protection to papers, magnetic tapes, photographic film, and papers against fire, but not for data disks. UL 125 rating indicates protection to all the items mentioned in UL 150 along with data storage disks. It is obvious that a small bedside gun safe doesn’t have to cost you an arm and a leg. But if you are choosing a quality safe to protect high-value items, you should probably ignore the price tag. To solve this confusion, we have included aptly priced bedside gun safes in this review with exceptional features. Based upon the above-mentioned considerations and ideal qualities, we have handpicked and reviewed the best bedsidegun safes on the market. The gun safes are extremely durable, inexpensive, and serve their purpose very well. All the safes mentioned below are certified by the California DOJ (Department of Justice). 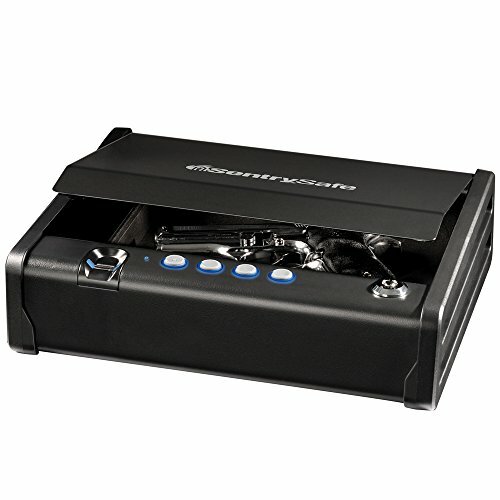 The Sentry Safe is a secure and lightweight means to store your valuables. The safe has been made from solid steel and features a curved pry-resistant door. The door of the safe has gas operated struts which open automatically when the lock is opened. The safe can be bolted to the floor and can also be wall mounted (using a couple of gun magnets to keep the gun in place). For added security, the gun safe has three lock mechanisms in total, the fingerprint lock, the keypad lock, and a key based lock. The fingerprint lock can be programmed for up to four different fingerprints. Meanwhile, the keypad and override key can be used for backup. The safe runs on four AA batteries, which have to be replaced with time. If you are a bit techy, you can also modify it to run on AC (however that’s not recommended). The gun safe is padded on the interior, which makes it safe for keeping valuables. 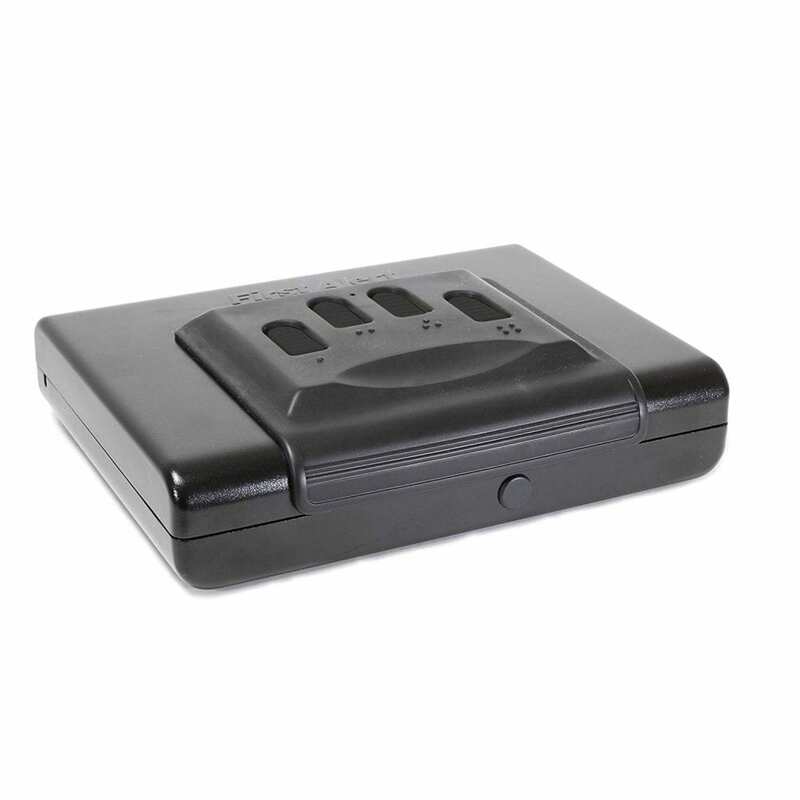 The SentrySafe is made from 12 gauge steel and is sturdy. The gas-operated door is silent and opens itself when unlocked, making the safe to be used single-handedly. Multiple locking mechanisms make it secure and safe. It has been priced appropriately, not to burn a hole in your pocket. 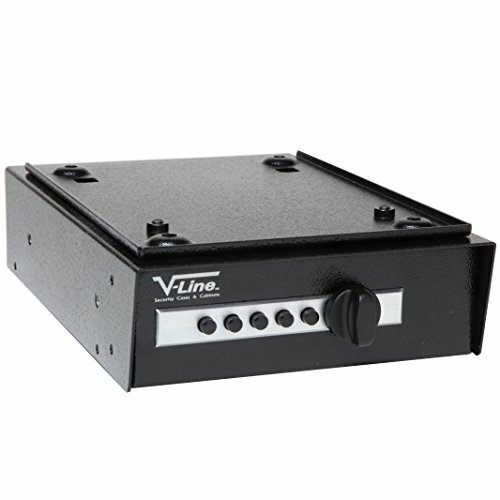 The Vaultek VT20i is probably the most advanced and sophisticated bedside gun safe on the list. The safe features a 16-gauge steel body, which is probably the most durable in its category. The safe has a fingerprint scanner which stores 20 unique ID’s. Additionally, it has a proximity-based, backlit keypad which can be programmed for more than 40,000 combinations. It also has a backup key lock in case of an emergency. The safe runs on battery power with a standby time of months with a single charge. The package also includes a USB charger so you can plug and charge the battery when needed. The safe features interior mounted hinges, anti-pry bars, two-point anti-impact latches, and newly-designed interior security brackets for ultimate protection against theft. This bedside gun safe can be mounted on walls or any base and includes the mounting hardware to let you do so. The safe has an interior LED with adjustable brightness, which is a plus. Moreover, you can also attach it to a security cable, in case you want to carry it with you. 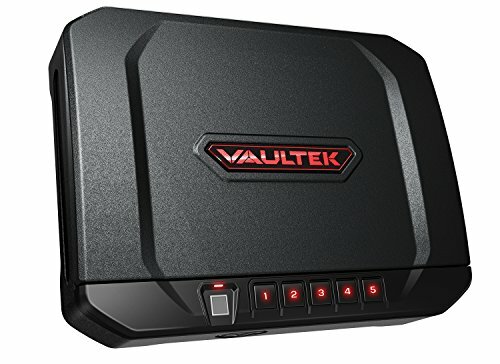 The safe also features a Bluetooth which connects it to the VAULTEK smartphone application so you can control and check the operational status of the safe. The Vaultek safe is durable and packed with a ton of features, which makes it an ideal safe. The smartphone-based app is amazing. Plus, the battery life of the safe is astounding. The contents included in the package are also enough. However, the safe isn’t fireproof and is a bit expensive. But its features more than makeup for these drawbacks. The V-Line safe is not only a bedside safe, but a drawer itself. The safe features a black powder-coated steel body which is durable and tough to resist any break-in. The safe has a simplex lock on the front lid, which makes the safe quick and easy to open. The lock can be programmed for combinations and eliminates the hassle of changing batteries or keeping the keys with you. The desk-mate security box also has quick release mounting brackets, which allow the safe to be installed below a desk or even sideways. The interior of the safe has a removable slide-out tray, which has been padded with felt to protect your weapon from any scratches, as well as allows for a silent draw. Welded anti-pry brackets are located between the sides and door lid for extra pry-protection. Makes a Bit of Sound. The V-Line drawer gun safe is very thick and durable, which ensures your valuables will be secure. The simplex combination key lock is easy to use and eliminates the need for any batteries and the problems associated with them. The safe is easy to mount and is a good option for shop owners. This thing is a brick! The Gunvault SVB500 has been around now for more than a couple of years and it still sells like hotcakes. This gun safe offers exceptional concealment and is ideal for use under office desks, shop counters, and below nightstands. The SVB500 has been made from 18-gauge steel which makes it astoundingly durable. The gun safe has been molded so precisely, that it is almost impossible to pry open. Additionally, the safe mounts almost anywhere and in any direction, which makes it even more discreet. 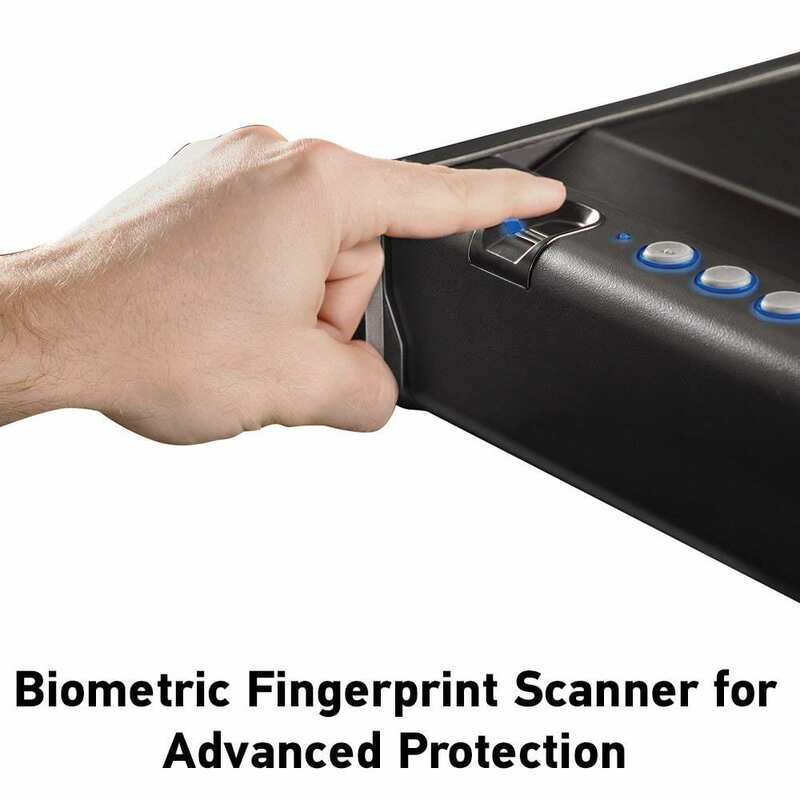 The safe features a biometric fingerprint-based locking mechanism, which can be programmed for up to 20 fingerprints. To cover your back, the safe also comes with a backup key in case of a lockout emergency. The inner cabinet of the safe is lined with foam and simply drops down when opened. The cabinet can store one full-sized handgun with a couple of mags on the upper section. The gun safe has an interior light to help you under low light situations. The system is powered by a 9V alkaline battery which lasts long. The SVB500 is a durable gun safe and is easy to conceal. The safe can be easily mounted in any place or direction. The operation is silent, plus it has an interior light which helps with using it in the dark. The gun safe can fit large-sized handguns and valuables. Good for office use. The 5200DF bedside gun safe from First Alert is a portable, spacious, and lightweight safe. Made from 18-gauge steel, its body is powder-coated to prevent rusting or chipping. The safe has a programmable ‘no-see’ keypad which can be programmed for codes between 3 to 8 digits. Plus, the spring-loaded lock mechanism is quiet and offers quick access to the contents in case of an emergency. The 5200DF bedside gun safe has pre-drilled holes in its base so you can mount it over any surface. The safe has a foam lining on the interior to protect the contents and ensure no damage is caused to them. The safe also includes a steel security cable which comes in handy when you carry it with you. It runs on 2 AA batteries and has a standby time of more than six months, with minimal use. Additionally, the safe is compact, lightweight, and easy to conceal. The First Alert 5200DF is a sturdy bedside gun safe which can either be mounted or carried portably. The ‘no-see’ keypad is good, but you have to use both hands to draw the weapon once the lid pops out, since the lid is heavy. The safe has ample space to store a couple of handguns with mags. Overall, it's a durable safe, but make sure you carry the backup keys when you take it outside. 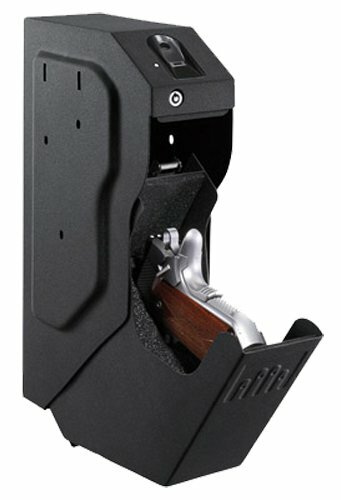 Another bedside safe from GunVault on this list, the MV500 has been designed to store compact and sub-compact handguns. Made from 20-gauge powder-coated steel, the safe is durable and sturdy. Plus, the inner foam lining keeps the contents secure. A patented ‘no-see’ keypad lets you access the safe easily and quickly. The keypad has an audible guidance feature while you punch in the code, although the safe also has a mute button to turn it off. The learn button can be used to program the safe with a code from 12 million available combinations. The safe weighs only four pounds and also includes a 4-foot security cable to keep it secure. The safe can also be mounted to the position you desire. The safe also gives a ‘low-battery’ and tamper warning, which is a plus. The MV500 bedside gun safe is sturdy, lightweight, and portable. It also warns the user about the low level of batteries and is easy to program with a lot of available combinations. The safe has a reasonable price and serves its purpose very well. Good only for compact handguns. Proper maintenance of your gun safe is a necessity if you don’t want it to malfunction in an emergency situation. Thankfully, servicing a gun safe is not as complex as servicing a car. There are just a few things you must consider. Let’s learn them step-by-step. Oil all the screws and the mechanical components properly. Make sure to wipe them dry with a clean cotton cloth. Use a mini dehumidifier or a rechargeable desiccant like silica gel to ward off any moisture that might cause rusting or dampening, especially in rainy or winter seasons, or when you aren’t going to open the safe for a long time. A bedside gun safe is a good accessory for concealing your weapons and valuables and keeping them safe. Such a safe must be durable, easy and quick to access, have an interior padding of some sort, and have some mounting options. A portable bedside safe is also a good option if you visit the range very often. Additionally, you must regularly clean and maintain your gun safe to ensure that it doesn’t malfunction under any circumstances.